Normally, I avoid reporting on products that get too much coverage, unless I have something different to say about it. Such is the case with the Nyko Wireless Nunchuk, a product that other gadget blogs are really bashing unnecessarily. Clearly, the negative reviewers have not played some of the Wii games that I play. For example, there are moves on the Dancing with the Stars video game that require moving the Wiimote and Nunchuk in a locomotion dance. The wire really gets in the way of the dancing, and so removing the wire makes it a lot easier. Also, I have a dog and a newborn baby who have this annoying habit of grabbing onto the connector wire while I’m trying to play. Now the doggy and baby won’t have anything to grab. Thank you, Nyko! Another complaint is that the price is too high, but I think that $34.99 is a small price to pay for something wireless. I have seen wireless products that do less useful things at a higher price. So, in your face, other gadget blogs! The Nyko Wireless Nunchuk is a cool product, and deserves some respect. 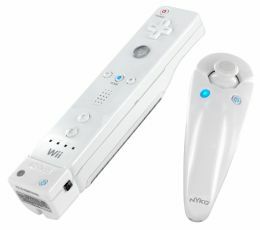 If you’ve got the Wii, get the Nyko Wireless Nunchuk and give it the love it needs.